I haven't even fully finished checking out all the spring beauty collections, and now we are onto summer! LOL. There are a few that have begun trickling out (I already picked up this stunner and this palette which will both be on the blog shortly! ), but Urban Decay's summer launches are one of the first ones I've had the chance to play with. 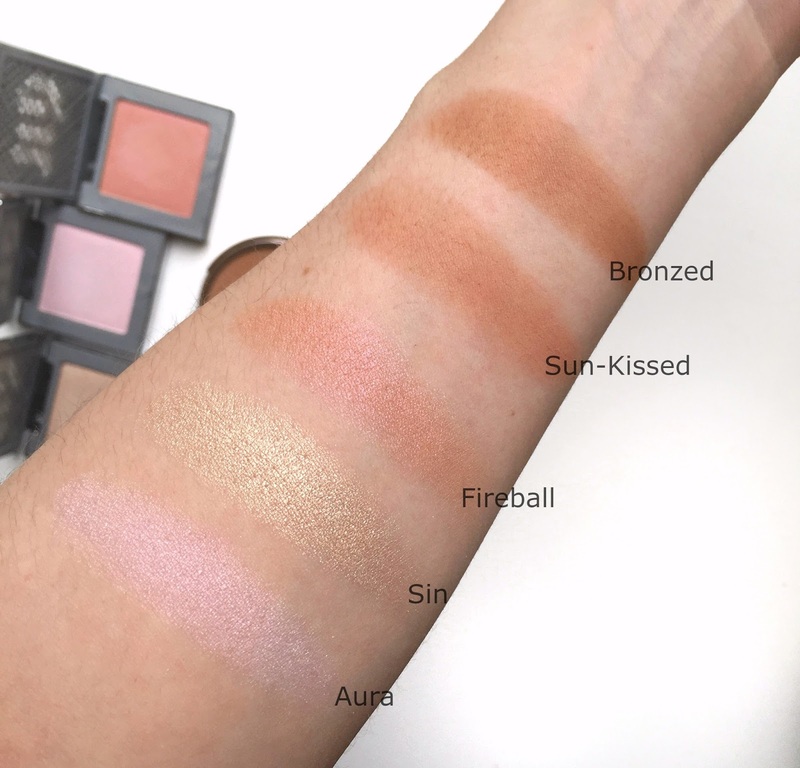 I already reviewed the Naked Skin Hybrid Complexion Perfectors here (full swatches of every color), and was thoroughly impressed, The remainders of the launch are fun highlighting and bronzing products that become a necessity when the weather gets warmer. 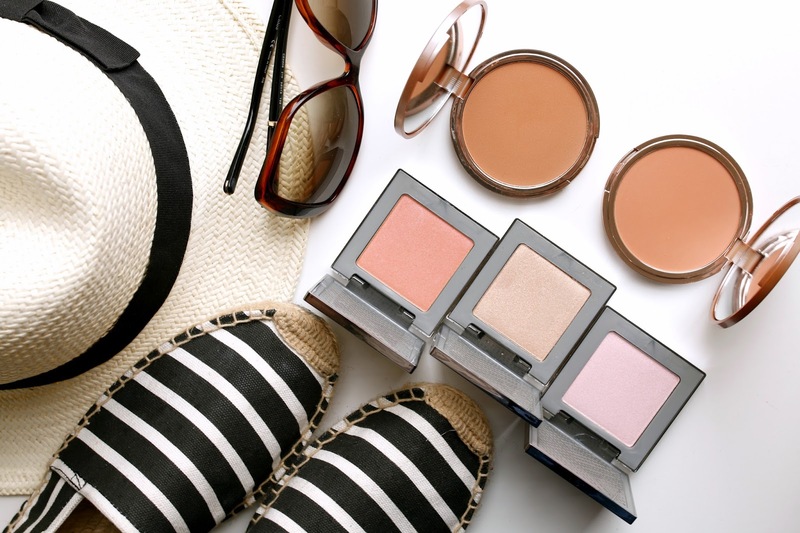 A beach glow (or at least faking one in my case) is a summer essential. 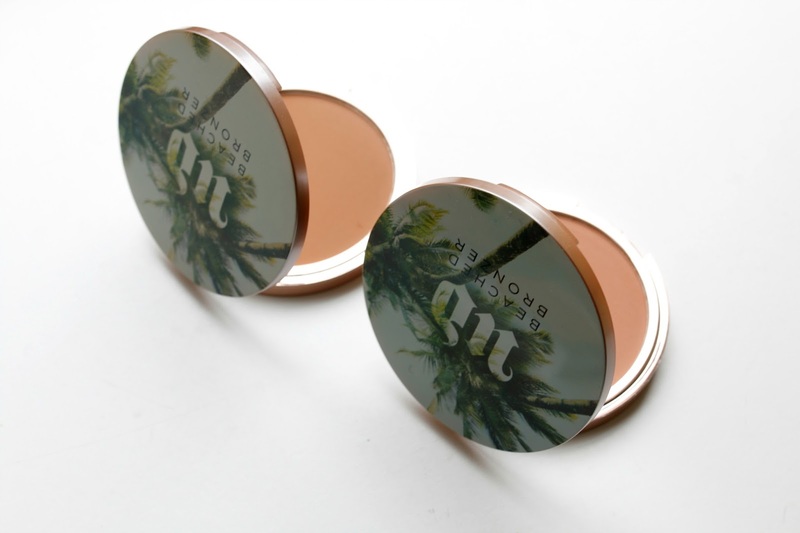 The packaging is the first thing that will lure you in with the Beached Bronzers. The palm trees on the compact are so adorable. There are two shades - Sun-Kissed and Bronzed which differ only slightly in tone, but have a similar texture and finish. For those that prefer a bronzer without much shimmer, these would be a great option. They are not completely matte, but have a slight glow that give some radiance when on the skin. I swatched them quite heavily on my arm below but they are easy to sheer out for those with fair skin, or build up for a more intense application. They do fall closer to the bronzey/orange part of the spectrum rather than bronzey/brown, but surprisingly they both look quite natural and fresh when on the skin. I don't mind a slightly warmer bronzer because if a bronzer is too brown, it can make my skin look dirty. Not cute. These are finely milled and blend easily, leaving my cheeks looking healthy rather than ooompa loompa-like. The bronzer struggle, right? Finding that perfect balance is crucial. The After Glow Highlighters were the most fun to play with out of the collection. 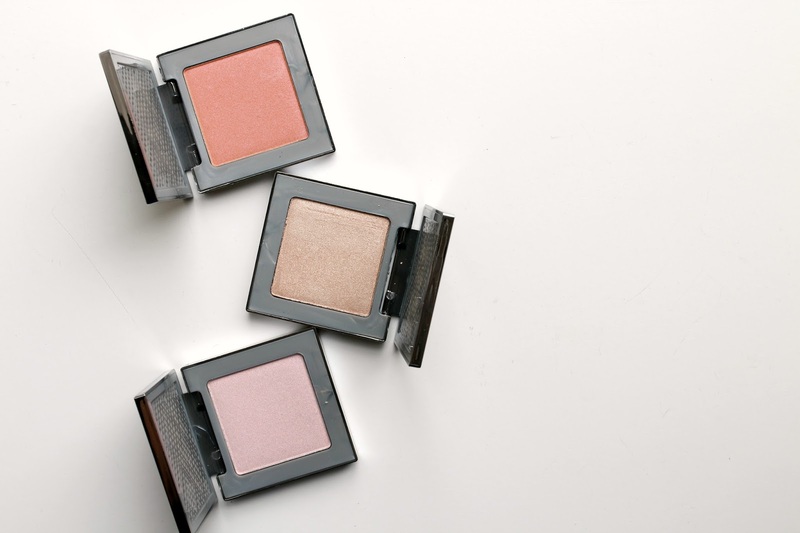 The texture is very smooth and leave quite a strong glow on the cheeks. Sin was my favorite to use as a traditional highlighter, while Fireball looked great layered over a matte blush to give my cheeks a bit of shine. The shimmer was manageable in the way that it could be added delicately for a just a hint of a glow, or stippled on to give a high watt shine. Aura was the only shade that took me a bit too far out of my comfort zone. I feel this shade would be fun in a makeup artist's kit but it was not a shade I would wear regularly. That being said, if you prefer more pink cheek colors, I could see this being a gorgeous shade to overlay on top of a matte pale pink cheek. These highlighters look beyond incredible!